Despite officially joining RB Leipzig from sister club RB Salzburg in December 2018, the enormously talented midfielder, Amadou Haidara, was forced to wait until March to make his debut due to him needing to recover from a nasty knee ligament injury. Handed his bow against Schalke 04 by the tactically superb manager Ralf Rangnick, where he played around 14 minutes, the Malian’s gone on to make a largely positive start at his new club. Although he was withdrawn at half-time in Leipzig’s 4-2 win over Bayer Leverkusen for tactical reasons, his goal in the 5-0 demolition of Hertha Berlin and assist in the DFB-Pokal vs. Augsburg have ensured he’s made a solid start. Adapting smoothly to life in Leipzig, which has been helped by the clear similarities between Salzburg and Leipzig’s playing style, there’s plenty of excitement about the dynamic 21-year-old. Rangnick’s recent comments evidence just how highly he rates his charge, saying: “He’s grown into an absolutely exceptional talent. There aren’t too many players of his age who have so much. He has all the capabilities to follow in Naby Keïta’s footsteps. A formidable presence on the defensive end, his aggression, intensity, and physicality have seen him cause many issues for his opponents. Remaining concentrated and alert, Amadou Haidara’s forever scanning and waiting for a press trigger to arrive before stepping out to apply pressure. Waiting for cues such as an opponent about to inherit a sloppy pass or one played towards the touchline, plus if Amadou Haidara’s marker is receiving back to goal or in an open body posture, he pounces so effectively. The above consequently means his adversaries can’t control the ball cleanly or turn and face their goal while giving them minimal time or space to execute their actions. 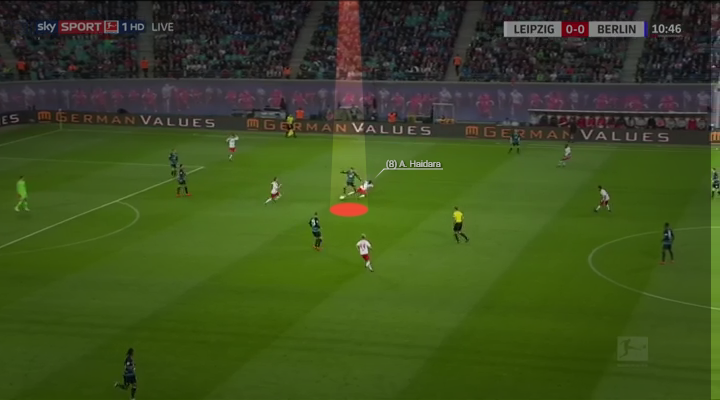 In addition, the way he angles his pressing to use his cover shadow to block pass lanes behind him has been another upside, for it further limits his foes’ options. His tactical awareness notably transfers over to when he’s keeping his defensive shape by shifting laterally to condense the pitch, covering his nearby fullback when they step up to press or by situating himself ideally in second ball situations. Making excellent decisions when to jump out and harry, hold his post, support a colleague, shift sideways and when to apply a forceful intervention, the robust Haidara, who’s already so familiar with the RB pressing framework, has been a force to be reckoned with on this end. Meanwhile, on the attacking side, Amadou Haidara’s flexed his muscles just as admirably. Technically excellent, the youngster possesses a neat first touch and controls the ball superbly in confined spaces under pressure, meaning he’s very capable of weaving away from dangerous, high pressure scenarios. Helped by his wicked acceleration and agility, this, in combination with his balance, strength and nice array of touches and maneuvers to outfox his trackers, has seen him be a real challenge to contain. Progressive and showing admirable ambition in his passing, he’s been eager to move the ball forward quickly and incisively. A fantastic exponent of the pass and move principle, which has seen him often latch onto one-twos in advanced locations, this has served him beautifully to receive return passes in forward facing postures ready to unlock opposition backlines. Moreover, his distribution quality has notably extended to when he’s played line breaking passes into the feet of his markers, struck precise through balls over the top or when combing intricately in close quarters. Haidara’s clever movement then ties everything together, for he’s adept at identifying and exploiting vacant spaces. By shrewdly targeting gaps in the opposition’s stopping setup, he creates decisional problems on who should mark him. This uncertainty will frequently see him get free, as a moment’s hesitation is all he needs to gain separation. Working cohesively with his colleagues, they regularly pin or draw markers away from certain zones, just as he does for them, to specifically open passages for his beautifully timed forward bursts. Be it when he’s pushing forward into the box to attack crosses or cutbacks, surging in behind or positioning himself in between the lines, his intelligence and sense of timing has shone brightly. By the numbers, his 4.95 dribbles p90, 4.89 interceptions p90, 3.4 tackles p90, 2.04 shots p90, 3.25 won aerial duels p90, 1.63 progressive runs p90, 1.22 shot assists p90 and 5.70 accurate final third passes p90 at a 93.3% rate has shown what an impact he’s already having. After a solid start to life at the Red Bull Arena, both Haidara and his exciting club will now just be desperately hoping he can remain fit and continue his steady upward trajectory, for he’s undoubtedly got all the raw talent to go right to the top of the sport. After making his senior international debut for Mali in a World Cup qualifying match against Ivory Coast, we should expect to see more of Amadou Haidara and his awesome antics for RB Leipzig. Support the rest of his squad when placing your football picks at Eastbridge brokerage’s Skype Betting service or through VOdds broker platform!